Working with Body Within has proven to be very easy to do and the convenience of having it done in the privacy of my home is unquestionable. I admit I was a little worried about working with different people for my training sessions, but I feel much better now that I’ve had the opportunity to work with each of you. I can definitely see the advantages of working with different trainers from an overall training and fitness experience. You are each consistent with each other and yet different in your approach. The coaching from each of you on being mindful of my form and slightly different ways of working the same muscle groups is actually refreshing. It’s like getting a bigger picture of the whole experience. I can also see that this will help to keep things fresh and not allow me to get bogged down in the sometimes mundane workout routine! Body Within keeps me in shape and on my game. 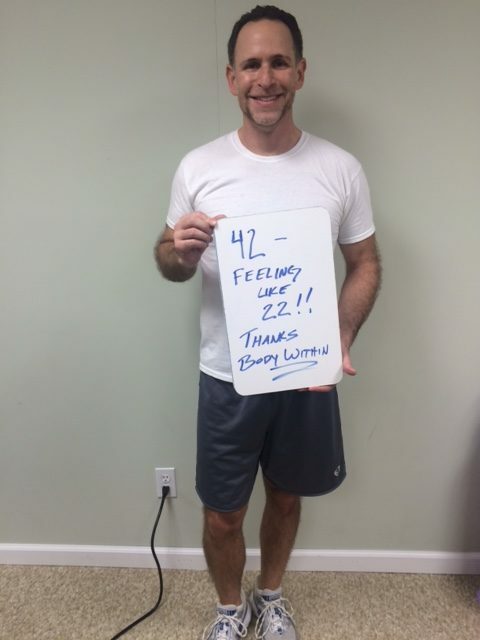 How does working with a personal training help you? I think the most important part of this question is personal. 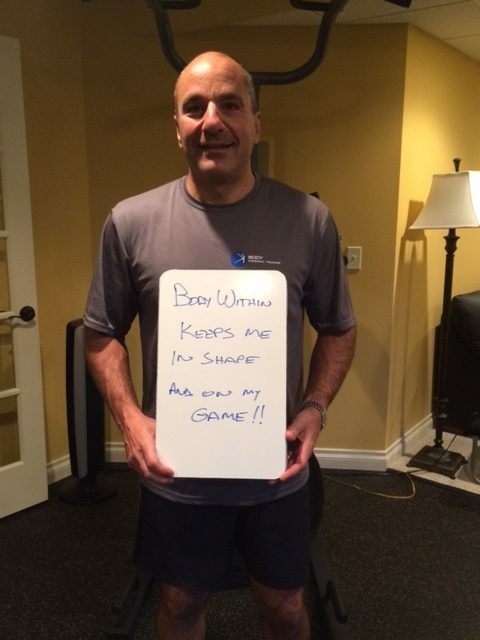 Working with the staff at Body Within helped me set up very obtainable fitness goals. I have been recovering from a lower back injury and after completing physical therapy it was difficult and sometimes scary to try to work out. I was in constant pain and wasn’t able to do some of my favorite activities. The program we set up worked within my abilities, focused on building up the muscles to support the injured area, and was convenient for my busy work schedule. Within two short months, I was back on the water skiing, which I hadn’t been able to do for two years! What has been the most helpful is that the trainers make some very minor adjustments through out the workout that raise the intensity of the work out. In essence you work smarter and get more accomplished in a shorter period. The biggest benefit I’ve experienced from working with a personal trainer is having a permanent focus on better health. In the absence of a trainer when life became hectic, I would not carve any time out to exercise. In addition, I would fall into the habit of not paying attention to my food choices. Working with a trainer provides stability and focus on an overall healthy lifestyle.